Rodney Keith Eskelin, aka Rodd Keith, aka Rod Rogers, would’ve certainly found the recognition during his lifetime that his talent demanded, if he hadn’t chosen to work in the lowest depths of the music industry: the “send us your lyrics” field, known today as the song-poem genre. 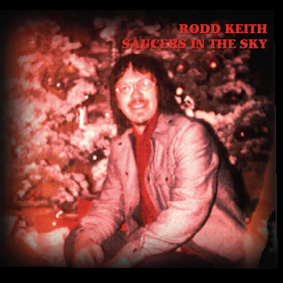 Saucers In The Sky gathers together twenty-six previously uncollected Rodd Keith gems from the hundreds upon hundreds of songs that he recorded before he leapt from a highway overpass in 1974. It would be inaccurate to call this a collection of forgotten pop classics. “Forgotten” implies that they were known in the first place. Outside of the aspiring lyricists who bankrolled the proceedings, plus a few of their friends and relations, none of Rodd Keith’s records registered the slightest blip on the musical radar of their time. The irony runs deep: the song-poem business was a stylus’ breadth away from being an outright scam, capitalizing on the dreams of would-be songwriters and filling their heads with visions of breakout hits and fame and fortune. In reality, if the lyrics themselves weren’t unwieldy or strange enough to hobble any chances of entering the charts with a bullet, the assembly line production style of the recording insured that the majority of the songs were musically undistinguished. The best of Rodd Keith’s work, however, easily transcends its lowly, no-hope origins, and therein lies the kicker: if the pressing runs for songs like “Magic In Her Eyes” or “Go Go Girlie” had broken the triple digit mark, or found their first point of sale in a Sam Goody rather than a thrift shop, they could’ve undoubtedly attained some measure of the popular success that their hapless creators were led to believe would follow. And while such tunes as “Ravens” or “Sawdust” were too lyrically bent for Billboard glory, they remain prime examples of Rodd’s brilliance as a singer, composer and arranger. Saucers In The Sky also includes two never-before-released tracks: a cover of “Here Comes The Judge” from a soul-soundalike session, and “Get On My Honda, Rhonda,” written as a birthday gift for Rodd’s best friend’s son. Packaged in a mini-LP gatefold sleeve, with liner notes from Del Casher, inventor of the wah-wah pedal and guitarist on many of Rodd’s early recordings, and Stacey Keith, Rodd’s daughter.